An RAF serviceman saw Iraqi civilians with bags over their heads being shouted at and abused by British soldiers, he has told a hearing. Senior Aircraftman Scott Hughes spoke at the court martial of seven soldiers charged variously with treating Iraqi civilians inhumanely and manslaughter. Cpl Donald Payne has already admitted the war crime of inhumanely treating civilian detainees in southern Iraq. He and six others deny other charges relating to the alleged abuse in 2003. The charges also relate to the death of Baha Mousa, 26, in custody in Basra. 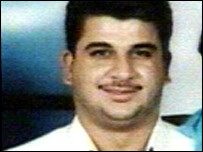 Mr Mousa, a hotel receptionist, was among a group of detainees arrested following a counter-insurgency operation in September 2003. SAC Hughes told the court martial, at the Military Court Centre, Bulford Camp, Wiltshire, he was visiting a British detention centre in Basra where 11 Iraqi civilians were being held when he heard "loud noises" and "shouting". When he went to investigate, he saw detainees with sand bags over their heads and arms outstretched. SAC Hughes said he saw Cpl Payne attacking an elderly detainee, nicknamed "granddad" by the soldiers - later identified as Kifah Al-Matairi - and kicking him in the kidneys. "He then put his fingers into his eye sockets and yanked his head up, it was as if he was gouging his eyes." SAC Hughes said Cpl Payne had asked him: "Would you like to see the choir?" Cpl Payne then went around the room kicking each detainee in the kidneys so each cried out in pain, SAC Hughes added. He also told of the smell of excrement, sweat and urine in the building, saying he was told the prisoners had soiled themselves. A day after his visit, SAC Hughes said he told his commanding officers what he had seen after hearing one of the detainees had died. "I reported it because I had a conscience," he said. "I had never really seen anything like that before. I did not know why I stayed that long. I was shocked." Asked why he had not intervened, he replied: "They [the soldiers] were a lot bigger than me and I didn't know what their orders were." Under cross-examination, SAC Hughes denied exaggerating or "spicing up" his account. SAC Hughes is the first British servicemen who was at the detention centre on the day of the alleged abuse to give evidence to the hearing. Last month, Cpl Payne, 35, of the Duke of Lancaster's Regiment, became the first British soldier to admit to a war crime after pleading guilty to the inhumane treatment charge. He denies further charges of perverting the course of justice and manslaughter. L/Cpl Wayne Crowcroft, 22, and Pte Darren Fallon, 23 - both also of the Duke of Lancaster's Regiment - deny the charge of inhumane treatment. Sgt Kelvin Stacey, 29, of the Duke of Lancaster's Regiment, is accused of assault occasioning actual bodily harm, with an alternative count of common assault. Maj Michael Peebles, 35, and Warrant Officer Mark Davies, 37, both of the Intelligence Corps, face charges of negligently performing a duty. And Col Jorge Mendonca, 42, formerly commander of the Queen's Lancashire Regiment - is now the Duke of Lancaster's Regiment - is charged with negligently performing his duties.